Cuban music started to become a worldwide phenomenon in the 1970’s as Salsa took New York City by storm. But even decades before that, Cuba exported musical styles like Bolero, Son, and Guaguancó far and wide across Latin America, which shares a common language and often other cultural traits. La Sonora Matancera is a very well-known original Cuban musical group. Both instrumentalists and vocalists (including some Colombians) came and went frequently over it’s remarkably long 50+ year history , and plenty of stylistic changes happened over time. Some say that the individuals were not so important to Cuban music as the group itself, which in general became an icon for Cuban music outside of Cuba, and eventually for the New York City latin scene following the Cuban Revolution. 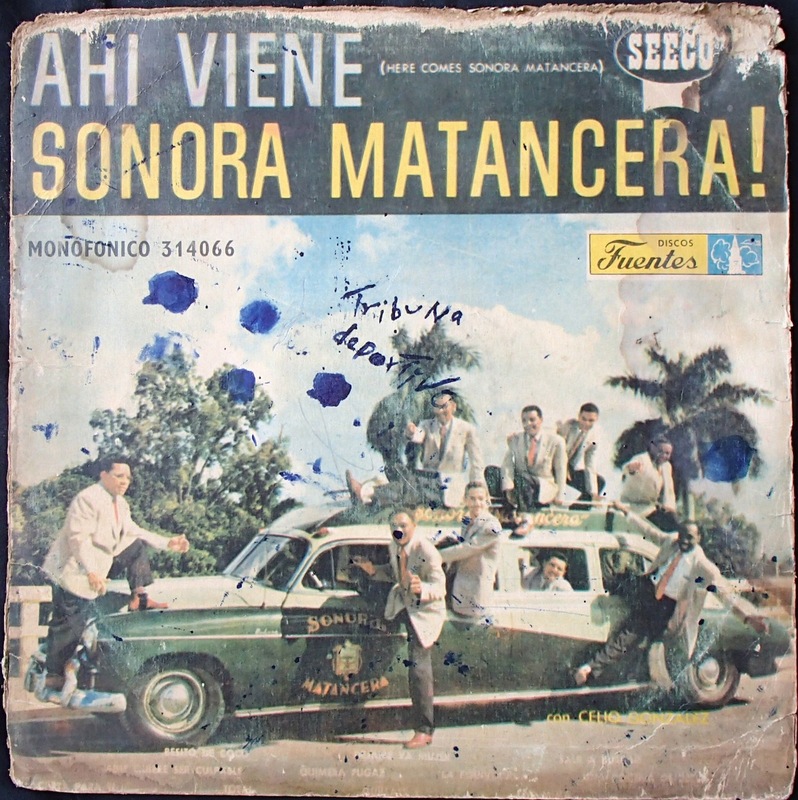 Ahí viene la Sonora Matancera (“Here Comes Sonora Matancera”) is a recording from August, 1970, that was published in Colombia under license from Sonora‘s primary New York label, Seeco. If you look, you may be able to find some cleaner recordings online than the ones I post here. Total is a bolero, a rhythmic but fantastically romantic style born in Cuba and broadly popular across Latin America. Designed to make you swoon. Besito de coco (“A Little Kiss of Coconut”) has a very Cuban sound. Listen: instead of the churning beat of the Colombian cumbia you hear constantly on this site, there is a crisp cowbell on each quarter-note to mark your step. In the background, a piano melody swings back and forth once every eight-beat phrase. It’s not salsa, but it is not at all unlike salsa. La equivocada (“She Who is Mistaken”) feels pretty upbeat, but if you speak Spanish, you’ll realize that it’s an awfully aggressive tirade against a former lover. Includes harsh one-liners such as: “I no longer care about your life” and “you aren’t worth one penny”. Still groovy though. Nothing like a latin lover/musician to make your break-up a danceable one.